My Europe gives a voice to young people and I will be listening to them. 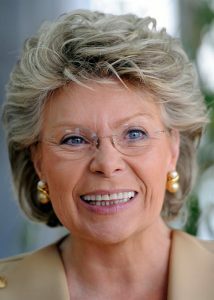 Viviane Reding was born in 1951 in Esch-sur-Alzette, Luxembourg. After obtaining a PhD degree (University Sorbonne, Paris), she worked as professional journalist for 20 years. In 1999, having served ten years in the Luxembourg Parliament and ten years in the European Parliament, she became European Commissioner for Education, Culture, Youth and Sport. In 2004, she became EU Commissioner for Information Society and Media. In 2010 she became the first Vice-President of the Commission and Commissioner responsible for Justice, Fundamental Rights and Citizenship. During her time in the Commission she has been responsible for several major policy initiatives, including the creation of the “Erasmus World” Programme, a reform of the telecommunication sector, the slashing of telecom roaming costs and the initiation of the “Justice for Growth” and “Justice for Citizens” agenda. In addition she strengthened the rule of law in Europe and launched the Europe-wide “Citizens’ Dialogue” series, ahead of the EU-Elections. In 2011 she launched the “My Europe” Initiative.